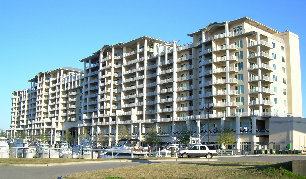 The Wharf shopping / dining / marina / residential complex in Orange Beach, Alabama. 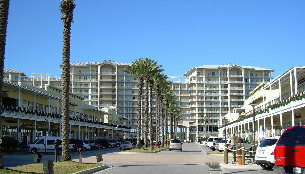 Celia contacted me to build a small stained glass transom for her new Condominium on the Intercoastal Waterway at the Wharf in Orange Beach, Alabama. Pictures of this exciting shopping / dining / residential complex are on the left. Celia wanted a classic design and bright flower motif with colors to match her existing color scheme. 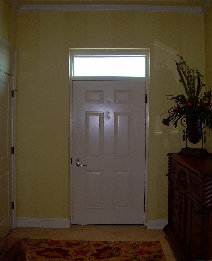 She wanted a clear bevel border to sparkle with the direct sunlight the transom receives part of the day. We used warm earthtone colors for the rest of the glass to really light up her foyer and a red glass accent border. Since she lives in my area, Celia showed me the window she wanted to fill, some color swatches and even a few flower designs. She knew what she wanted! We came up with a stylized iris design with a bit of classic Art Nouveau flair. She chose glass colors and I got started. Celia was the perfect client to work with! 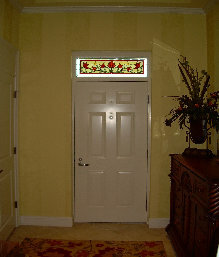 Celia's Transom was completed in December 2008, measures about 11 3/4" x 35 1/4" and contains 142 pieces of glass.